After survey results indicated that a large portion of Fremont residents are interested in solar energy, the Fremont Department of Utilities is moving forward with planning a community solar farm in Fremont. More than 70 percent of Fremont’s residential population responded through an August, 2016, survey saying that they were interested in getting power from a community solar farm. The first step in the process will be to present information about community solar at the Fremont Home and Builders Show held Friday through Sunday at Christensen Field Community Center. Read the entire article here. Photo: Central City, Nebraska. What a community solar farm might look like in Fremont. 32nd Annual Fremont Home and Builders Show to open this weekend, by Chris Zavadil, Fremont Tribune. Free admission to the public! The show, sponsored by the Construction Employers Association of Fremont, will open at the Christensen Field Community Center from 6-9 p.m. Friday, and continue from noon to 8 p.m. Saturday, and from noon until 5 p.m. Sunday. All 93 vendor booths, as usual, have been sold, Event Coordinator Ron Spahni said. Read more. 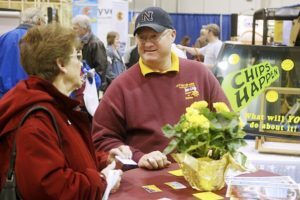 This entry was posted in Community-Scale Solar, Green Building, Nebraska / Midwest News, NewsBlog and tagged 32nd Annual Fremont Home and Builders Show, community solar, Construction Employers Association of Fremont, free community events in Fremont, free community events in Nebraska, Fremont Department of Utilities on January 26, 2017 by Helen Deffenbacher.